Join this tour and prepare to be amazed by all the wonders that await you in the beautiful Barcelona, Spain. You will do four different tours departing from your hotel base. You will follow the preferred routes of the motorists, some fast and others of winding curves and always with the promise of panoramic views of incredible landscapes! The hotel is in Molins de Rei and offers easy access to Barcelona via the nearby E-90 motorway. Private parking is offered on site, at an additional cost. The Calasanz’s restaurant offers typical Catalan cuisine. There is also a tour desk and a bar. All rooms at the hotel have air conditioning and heating, as well as free Wi-Fi and a flat-screen TV. 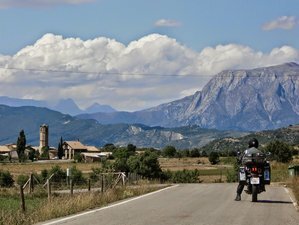 To start the first day and get a taste of driving over the Africa Twin, you will go to see the mythical and mysterious mountain of Montserrat and its monastery. Then, you will see the castle of Cardona. You will then look for a place to eat. Today, it will be a long route but remember, you will go towards the Pyrenees by the most traditional motorists. The route will take you along Barcelona, Solsona, Oliana, Sort, Tremp, and back to Barcelona. Today will feature a central tour to the natural park of Montseny and surroundings, going along non-stop curves. Today, you will go to the south, for the best roads between land of vines, in a recognized region of good wines like Priorat or Penedes. There is the possibility to visit Spanish cavas. There is possibility to rent the helmet. For other equipment, you are recommended to bring it as well as the helmet if possible. You can also buy them at a good price. You will be accompanied in the store if you need help. This tour will take place in Spain, going through Barcelona, Solsona, Oliana, Sort, Tremp, Priorat, and Penedes. The price of the package includes daily breakfast and dinner. While visiting the city of Barcelona, you can have a beer at the famous Ace Cafe. You will also have the opportunity to visit vineyards.